Introduced in 2014, the lean luxury segment of Cinnamon Hotels & Resorts, Cinnamon Red is set to expand to the Hill Capital Kandy. A groundbreaking ceremony was held to mark the start of the project’s construction which is scheduled for completion in two years. Cinnamon Red Kandy will be the first and only Leed Gold certified hotel in Kandy, developed at an investment of LKR 6.5B. With a portfolio of over 2400 rooms in Sri Lanka and the Maldives, Cinnamon Hotels & Resorts joins hands with reputed investor Indra Traders in a joint venture to introduce the new breed of hotel to the city of Kandy. This development is a timely initiative by both parties and underlines the confidence in tourism arrivals and the growing needs of visitors to the hill capital, which will be further augmented with access to the highway. Indra Traders’ investment of 60% includes a 130-perch plot of land on the Katugastota Road, Kandy. A long-term management contract has been executed between the parties with Cinnamon Hotels & Resorts as the hotel managing partner. Cinnamon Red is a pioneering brand of hotel under the Cinnamon wing. It combines economy with elegance in a trendy and vibrant product embodying the concept of Lean Luxury. With its state-of-the-art design and technology, Cinnamon Red is an expression of modernity in hospitality in Sri Lanka. Cinnamon Red has already become a popular base for travelers to Colombo and has won recognition on multiple platforms and booking channels. Among its accolades was its win at the National Tourism Awards for the Best Hotel in its Category, and the Best New Entrant win at the SLIM Brand Excellence Awards. Most recently the hotel secured an award from Booking.com for delivering exceptional levels of guest satisfaction. The hotel’s opening in Kandy is scheduled to take place alongside the opening of the Kandy-Colombo expressway which is expected to boost traffic and accessibility to the city. 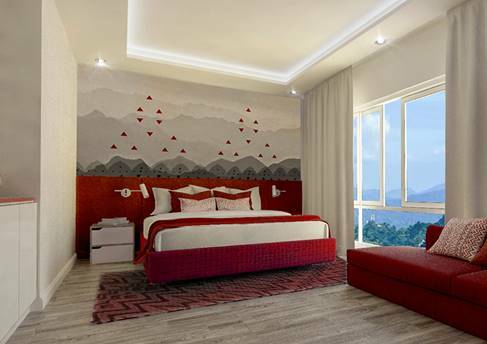 Cinnamon Red Kandy will feature 210 modern and elegant rooms and public spaces, that will have a distinct cotemporary flair and will reflect the rich heritage and culture of Kandy. The hotel will have a signature self-check-in service and a host of facilities including an expansive rooftop bar, 20 interconnecting rooms that will be ideal for business groups and families, wheelchair access throughout, a large swimming pool and restaurant that will serve all meals on a buffet and á la carte basis. Cinnamon Red will serve as the ideal location for travellers to explore the city of Kandy while on holiday or business trip.